Our new lines of Premium embossed machine PET are precision made in Germany with double screw technology, making it split free. 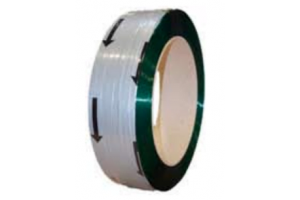 The strap end is secured tightly at the end of the roll without tape, to avoid pulling tape into the machine. Machine PET is also suitable for manual hand tools and battery powered friction weld tools. Below are our stock sizes.